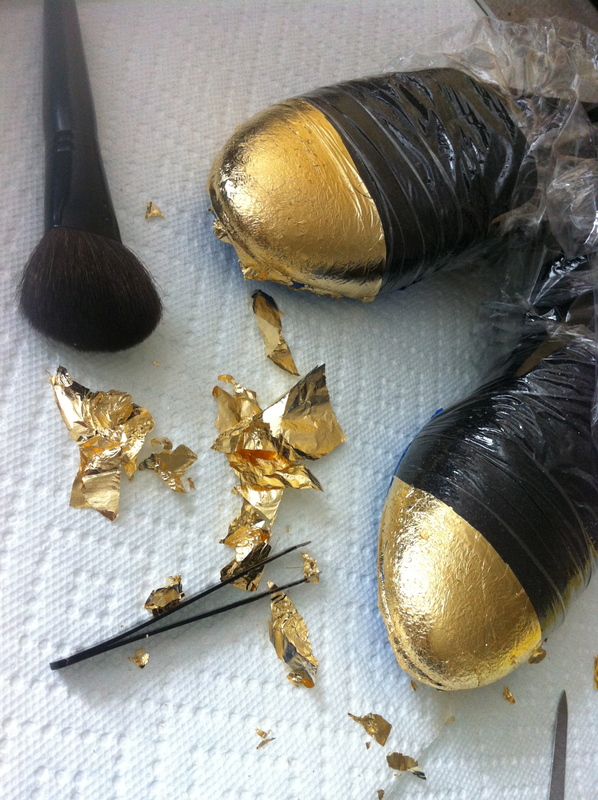 Gold Leaf Everything. But, Really. Do you ever have a pair of shoes (/bag/necklace/whatever) that you just adore, and they get damaged beyond being able to actually wear them again? I mean, you could wear them… but it may not be the look you are really going for if you know what I mean. 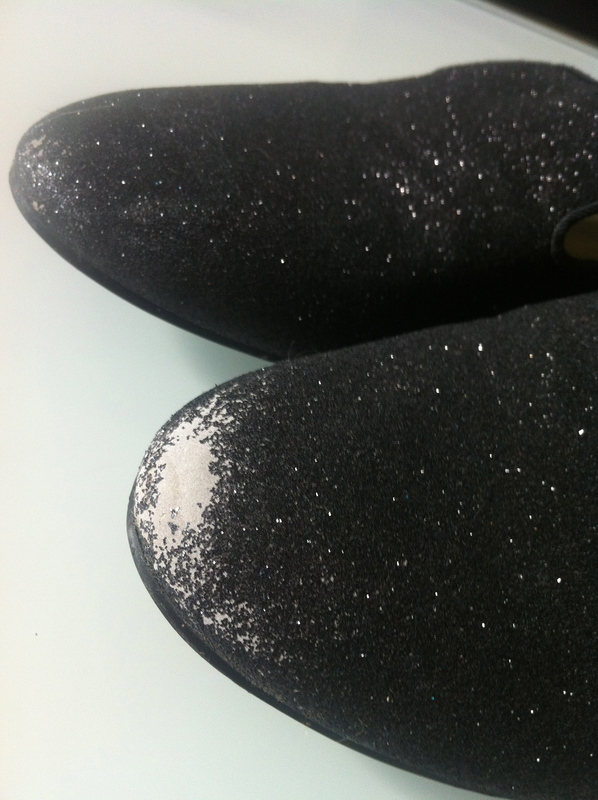 That, lovelies, happened to my brand new black glitter slip-ons. I wore them maaaaaybe three times and the glitter started falling off in masses. The worst is that the base material is this awful dull grey, which just made it look even worse (why couldn’t they have used black?!). 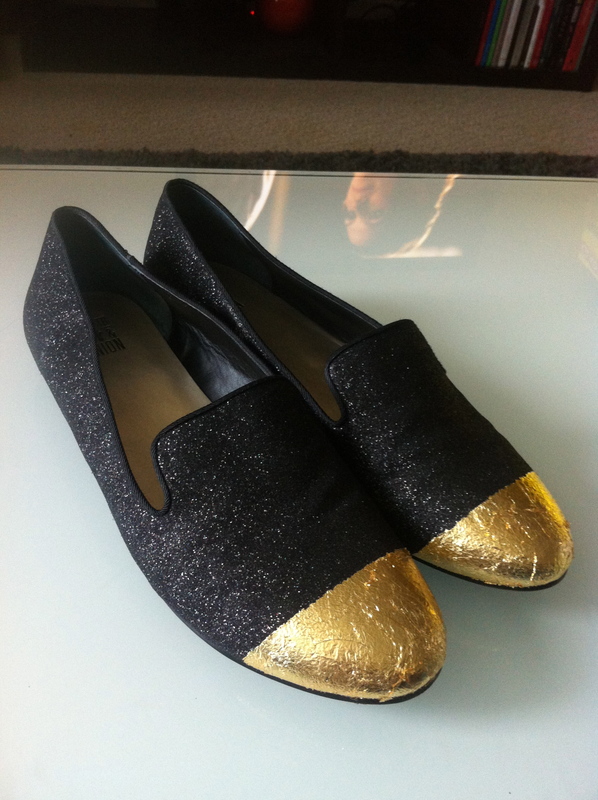 But alas, after I got back from NYFW I was really inspired by the shoes that Eleven Objects used in their presentation, as well as the creative use of Gold Leaf in their Fall 12 collection overall. Enter my stash of gold leaf I had from an old project. I figured, “What’s the worst that could happen?” and started my Saturday project. 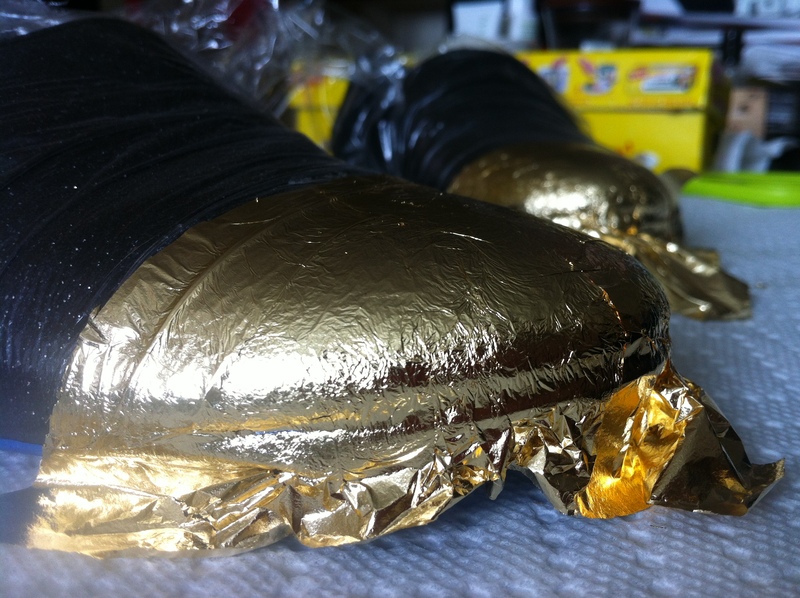 To be honest, it was super easy and relatively quick, I highly recommend gold leafing everything you own… I’m about to. 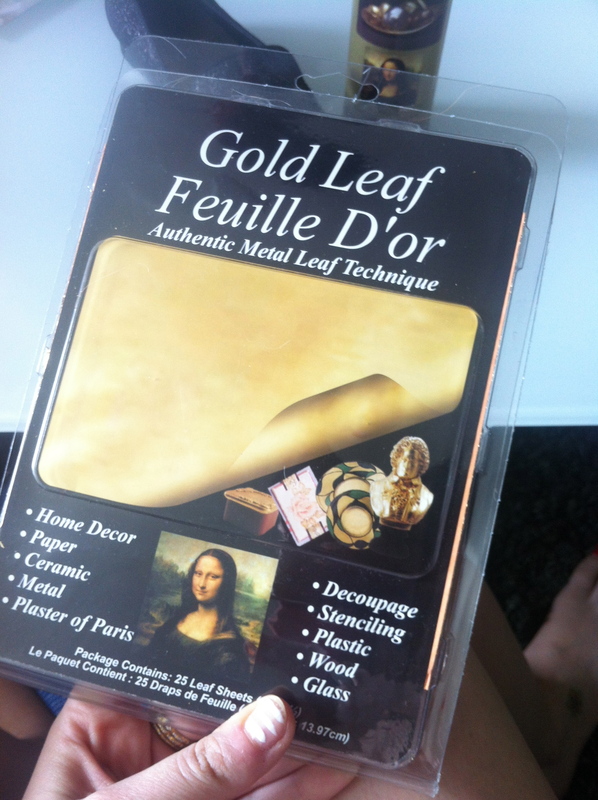 You can find this standard Gold Leaf (it also comes in silver and copper) at any craft store. Mine had 25 sheets in the one pack, so be ready to see more gold in my future. DOn’t forget the spray adhesive, it’s the best! Partially through the process. 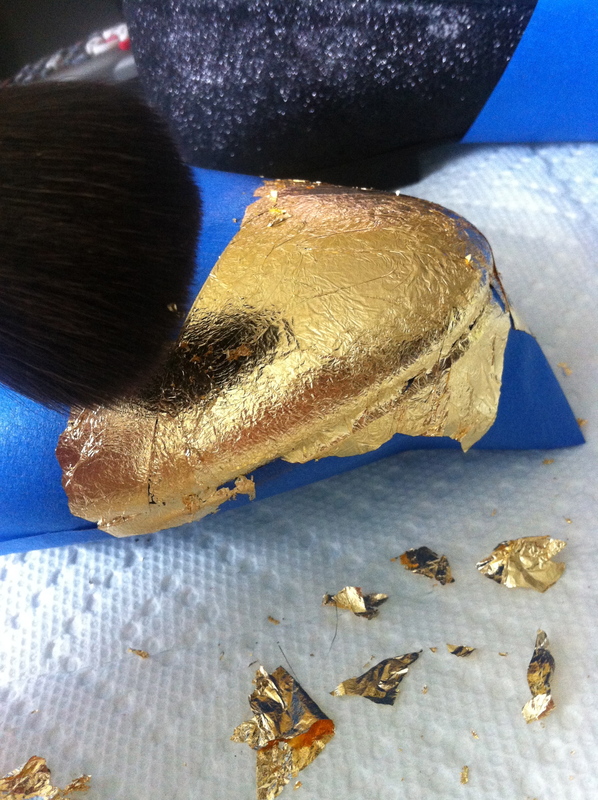 I used a large makeup brush to dust off extra gold, and tweezers for any gentle touch-ups. It’s very brittle, but can be laid on in tiny sheets if needed. I was also going for texture, so I didn’t mind multiple small pieces. Finsihed product! I hadn’t sealed it yet at this point (don’t forget to buy sealer, I did!) so it actually ended up looking a tad smoother and shinier than pictured here. After wearing them a few times, they are pretty durable and the bonus is that the sealer is now keeping the glitter on the remainder of the shoe. I have a feeling this won’t be the last thing I take my gold leaf supplies to, so stay tuned. As always, I post a lot of my home projects on my instagram (@hot_on_a_dime) as I’m working, so pop over there to see things a little quicker than they show up here! This entry was posted in Custom Creation, Weekend. Bookmark the permalink.